Granny was famous for her award-winning apple pies-and notorious for murdering her husband Jacob at their homestead in Julian, California. The only trouble is, Granny was framed, then murdered. For more than one hundred years, Granny's spirit has been searching for someone to help her see that justice is served-and she hits pay dirt when she pops in to a séance attended by her great-great-great-granddaughter, modern-day divorced mom Emma Whitecastle. Together, Emma and Granny Apples solve mysteries of the past-starting with Granny's own unjust murder rap in the final days of the California Gold Rush. 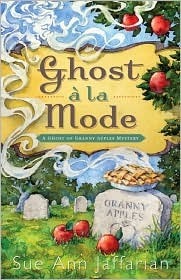 Despite some spelling/grammar errors, GHOST A LA MODE was a pretty good book. I loved the humorous elements and wished there had been more. And I especially loved the romance element between Phil and Emma! Again, I wanted more! The mystery part of this cozy did take a bit too long to get started (20-25% into the book) in my opinion, but once it did it was great. My only issues with this book were the time inconsistencies, mainly in the span of about 12 hours Emma had at least 15 (exaggerated a little for dramatic effect, more like 5 or 6… but still) "dinners" with 3 hours between each meal! And the first was at 3pm! My aggravation was really getting tweaked and I developed a tic in my right eye every time Emma wanted food. Anyway, there were a few times in the middle where I was getting bored with GHOST A LA MODE due to the iffy pacing leading to a wandering mind, but I am soooo glad I stuck with it! The end was great and more than made up for the earlier pacing problems. I'm definitely looking forward to getting my hands on the next book in the series. I like it! Especially how the pie "aroma" forms Granny, I thought that was a nice touch. Authors' name could use a bolder font though. Not bigger, just bolder. I know some authors like their name to be the most prominent element on a cover (smh), but I feel this is the perfect size, just hard to see on an ereader. - Emma and Granny's gift to Elizabeth at the end… I was a blubbering mess! lol I ask myself that daily. Since most of my TBR pile is ebooks, I'm usually in denial about how many I actually have in it most of the time. Ugh, I'm pretty sure that makes it worse lol.